Don't let your adult coloring pages stay in the book – use them to make something awesome! Here are unique 10 ideas you'll have to try with your finished coloring sheets. 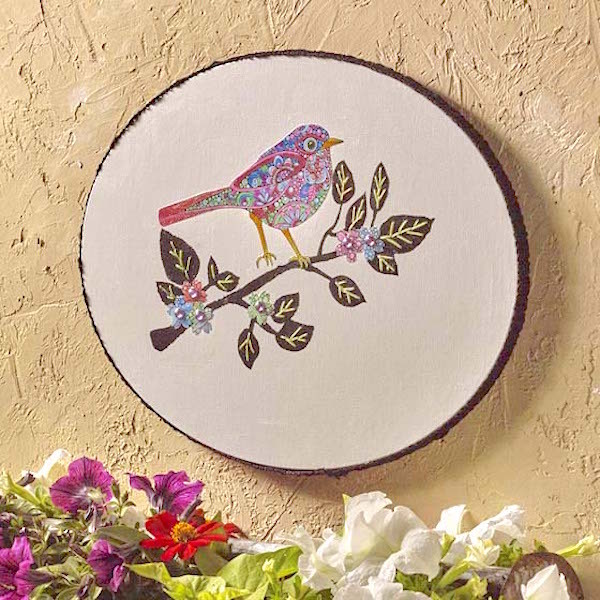 Don't forget to scroll down to the bottom of the page to get a video of the bird wall decor project I feature in action. Skills Required: Beginner to Intermediate. It really depends on what project you pick below. 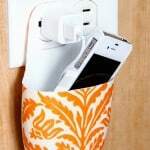 The furniture and t-shirt are more intermediate projects while the smaller items (jewelry, home decor) are best for beginners. I hope you'll decide to tackle them all! 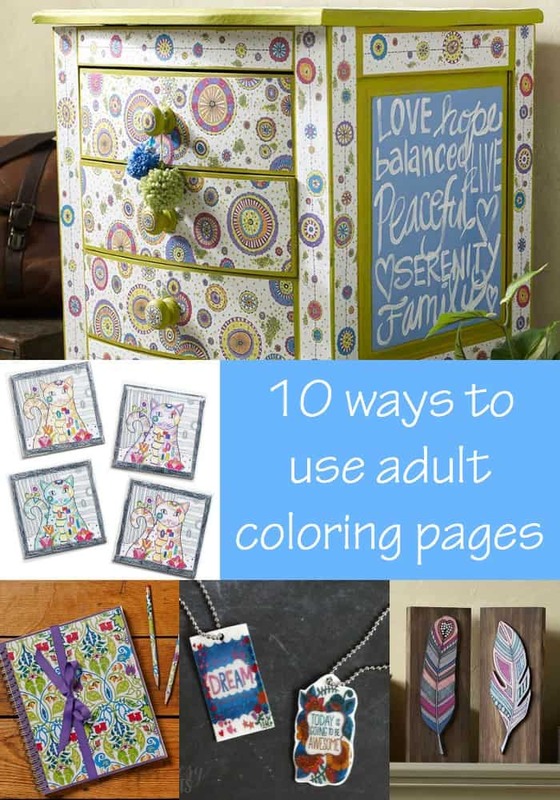 Adult coloring is all the rage these days, as I'm sure you know! I've done guides over on DIY Candy that show you how to color and what the best pencils are for coloring. I've also give you the ultimate guide to free coloring pages over there. 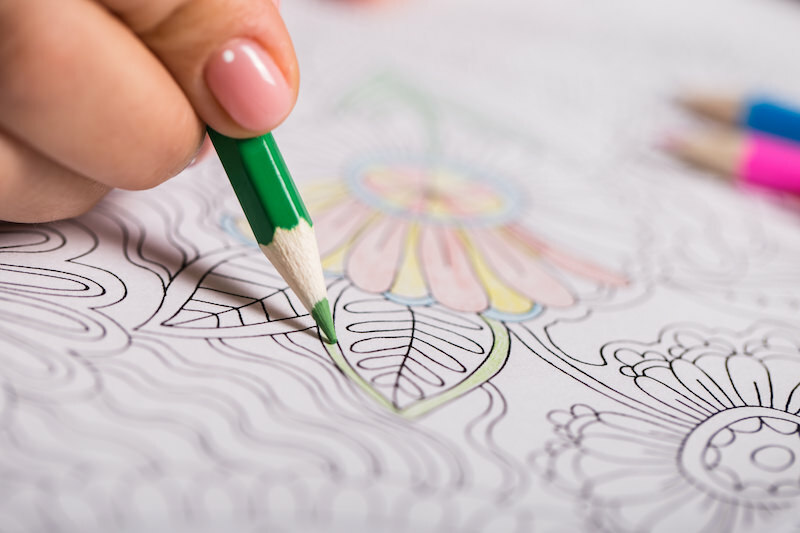 Are you wondering what to do with finished adult coloring pages? In this post today, I'm going to show you what to do with your coloring pages once you are done creating them! I've already done two projects on this blog with coloring sheets: a name plaque as well as a decorative tray. I had SUCH fun making them. Yep, you need to get those finished adult coloring book pages out of the book and onto a project. If you don't want to cut up your coloring books for whatever reason, make a color copy to complete these projects. I don't mind cutting mine up because guess what – that gives me a reason to color another! Before I share the projects with you, I wanted to address a few commonly asked questions and issues you might run into based on what readers have already asked me. 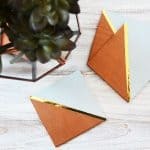 I hope these help you as you craft with your coloring sheets! Will My Crayons or Markers Smear? I'm so glad you asked! I actually wrote an article about using Mod Podge with markers and crayons (amongst other art mediums). Mod Podge works well on top of gel pens, crayons, and several markers. Note that it smears Crayola marker, which might be an issue with kids coloring pages. If you use something I didn't test, then do your own test on a piece of scrap paper. Of course, this only applies if you use the actual pages versus making color copies. If you plan to make color copies of your adult coloring pages, read the section below. If you choose to scan and print your coloring sheets, you might be wondering which paper you should print them on. I highly recommend a matte paper that is thicker than regular printer paper – about 32 lb. or above. Regular printer paper is typically 2o lb. or below. In addition, if you are printing the adult coloring pages, you'll want to print them on a laserjet printer if at all possible. Inkjet printed pages will smear when Mod Podged, although you can spray both sides with clear acrylic sealer and then the risk is less. I will say that my HP printer has a very dry ink (the standard HP ink). If I print something and let it dry for several hours and then Mod Podge it, I don't get any smearing unless I go over it several times. If I didn't have the HP printer, I'd just get laserjet copies of my coloring sheets because it's easier. Each project lists the formula you should use in the tutorial if you click on the link. You'll use Hard Coat for the furniture projects, and Gloss, Matte, or Satin will work for the home decor pieces depending on the finish you desire. You have some flexibility if it's hanging on the wall. Enjoy these 10 projects . . . most of them using decoupage . . . that will turn your coloring into useful crafts. 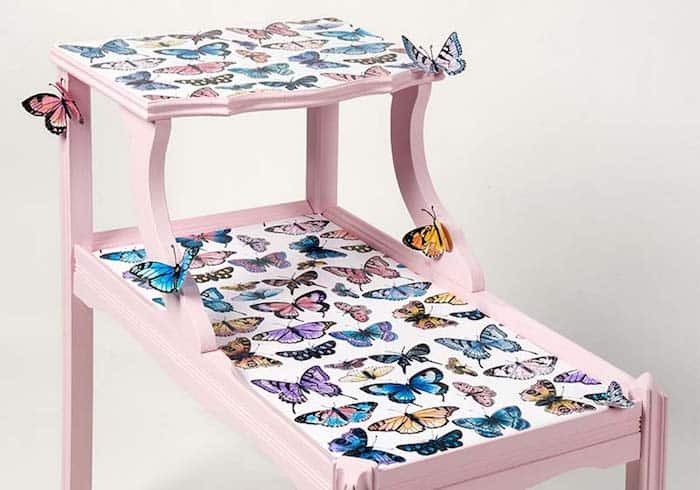 Decoupage a funky little side table with your coloring pages – and Plaid even provides a freebie that you can print and color when you go to their post (click on the “Instructions” tab). 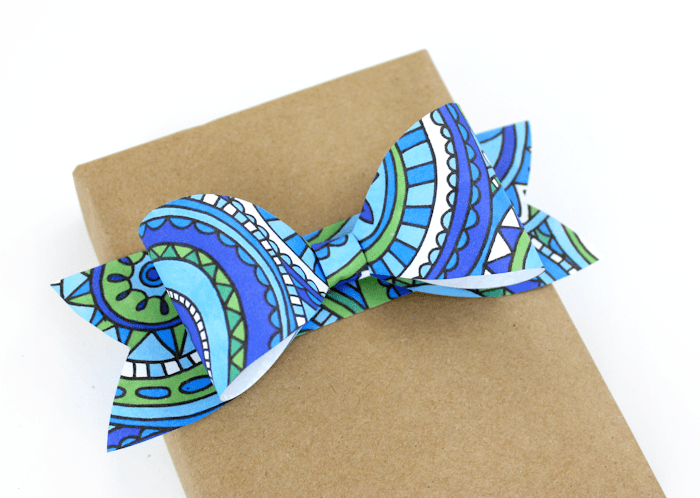 Lines Across turns her fabulous adult coloring pages into handmade bow for packages. 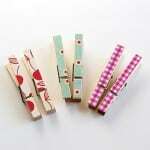 What a fun way to jazz up craft paper! 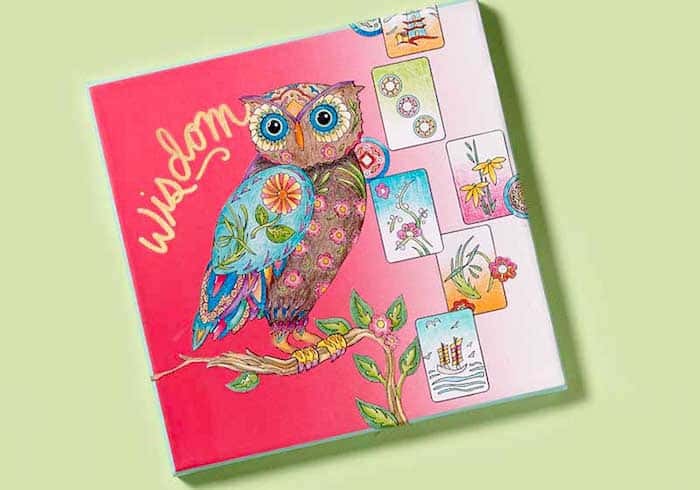 This journal makes the perfect gift, and uses Matte Mod Podge to seal. 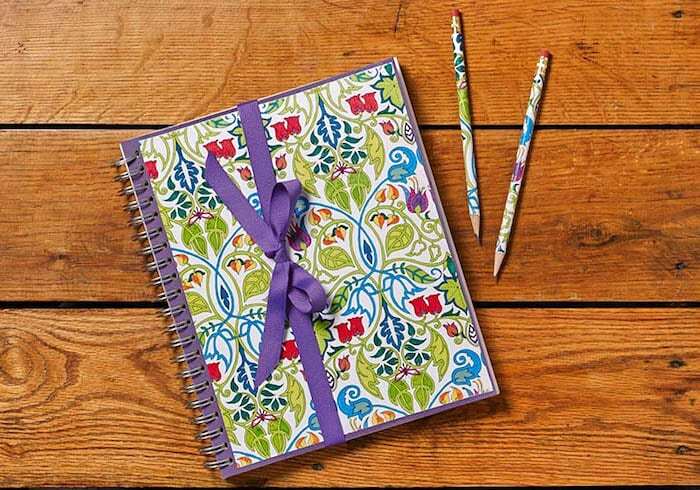 Give to a best friend or mom for Mother's Day (and don't forget the pencils!). I'm loving these keychains at DIY Candy, which are actually made with Shrinky Dinks. And you get the added benefit of Dimensional Magic to seal! Adult coloring pages are perfect in mixed media. This tutorial shows you how to create custom wall decor from your finished coloring pages! 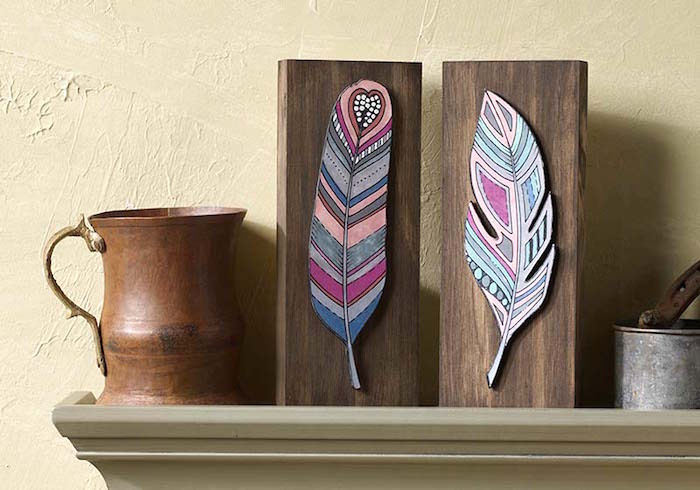 Create a whimsical home decor accent with this feather art at Plaid Crafts. When it comes to adult coloring projects, this one of my favorites! I LOVE Mod Podge Photo Transfer Medium and you will too. 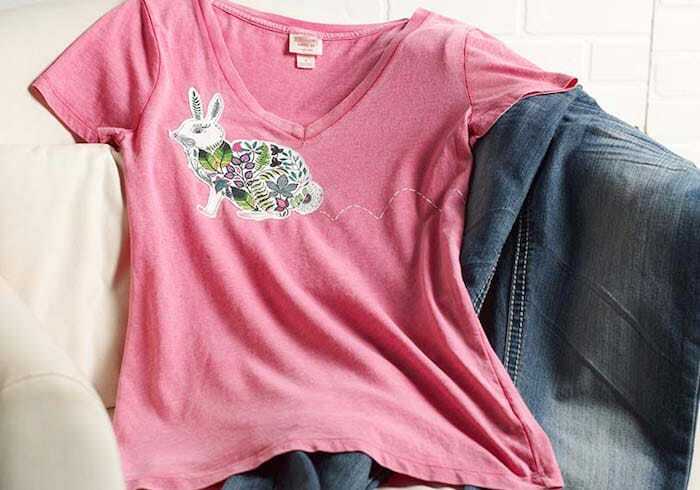 Turn your coloring pages into wearable art with this tutorial. 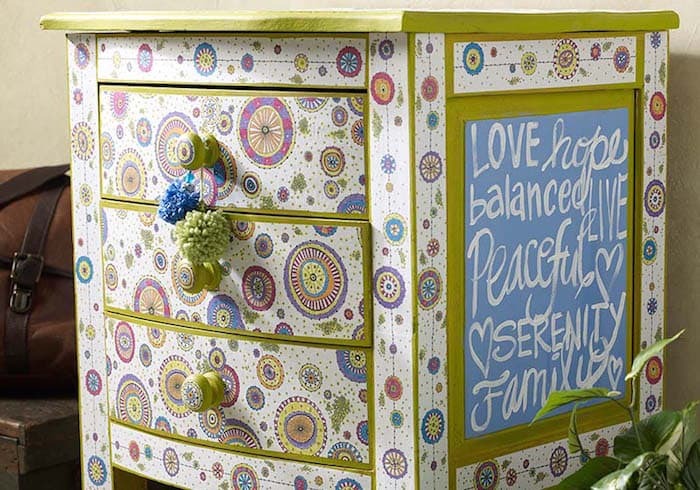 Circles and dots look fabulous on this piece of furniture. Print the free coloring sheets that are included under the Instructions tab, and color to your heart's content. Every good decoupage crafter loves making coasters – learn how to make them with your adult coloring book pages and Mod Podge. I love that you get to use a variety of materials in this project including a stencil, paper, embroidery floss, trim, and gems. It all comes together for the cutest bird canvas ever! What is your favorite project to make with adult coloring book pages? I'd love to hear in the comments! Awesome roundup post, Amy! it simply never occurred to me you could DO something with the coloring pages. Duh!!! When the grand-kids come over for a week-end stay, they always end up coloring or crafting. I take a picture of their work which goes into their album (to be given to them when they are 20), some drawings decorate my wall in Grandma’s workshop or my craft room, or I surprise them by using their drawings to wrap their birthday gift. Fabulous projects! I turn my coloring pages into faux stained glass. I think that dresser is so fun! It would be so cute in a little girl’s bedroom! Wonderful! I have been coloring since 2002. I have been framing my art. Now, you have given me ideas that are fabulous!! I love that the crafting world has finally recognized this wonderful and relaxing craft. For all of those who scoff at it, I say: Don’t knock ’til you try it!! I’ve never given thought to doing anything with my coloring pages…. but this post and some of the comments bring me some awesome idea that I might just have to try. Can the pages be Mod Podged if they’ve been colored with markers? I’m afraid the ink will smear or run. Love these projects. Hi Bailey! I actually did an article on that! Wow! This is really exciting and interesting idea to use coloring pages! It is great idea for fresh spring project for a good mood. Thank you so much! Thank you so much for the awesome ideas, great personal gifts. What a great post Amy!! 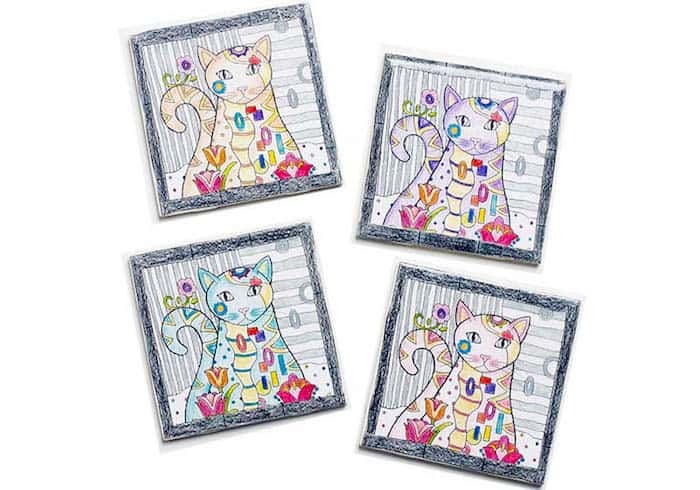 Those cat coasters are so cute! !